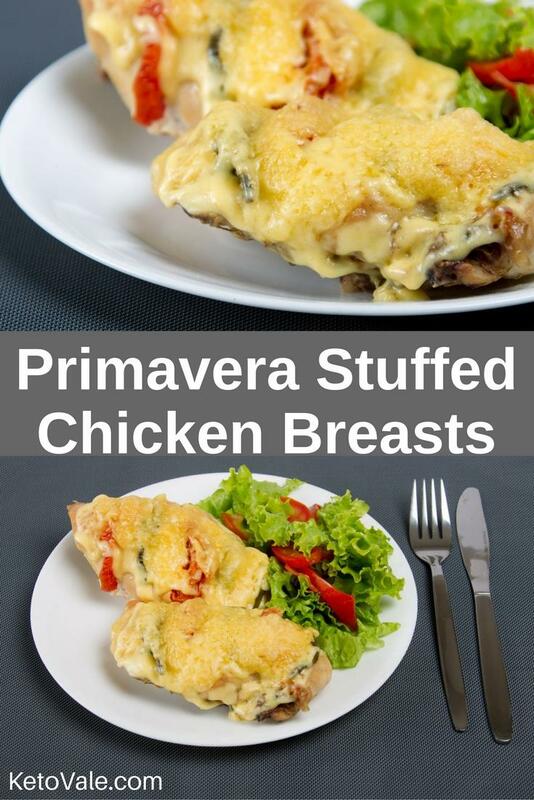 Primavera stuffed chicken is a pretty, tasty, colorful and exciting way to enjoy chicken breast without being bored. You and your family will love this dish. Especially, if you have special guests coming for dinner, this recipe will wow them. 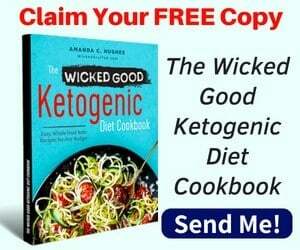 Although it might look a little bit complicated, it is actually easy to prepare. 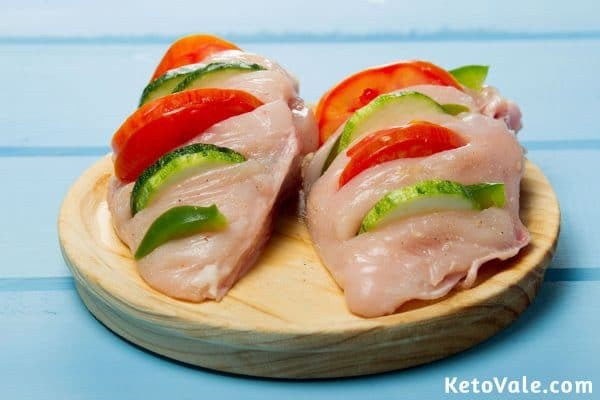 Simply make some slits in the chicken breast and stuff the colorful low carb veggies in and season it the way you like. Then all you need to do is to cover with cheese on top and let the oven do all the work. 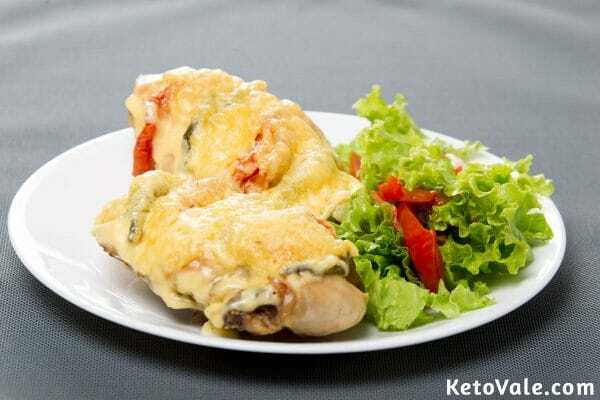 Sit back, relax and watch how the ordinary and dry chicken breasts get transformed into an amazingly colorful and mouthwatering dish with a great combination of textures and flavors. 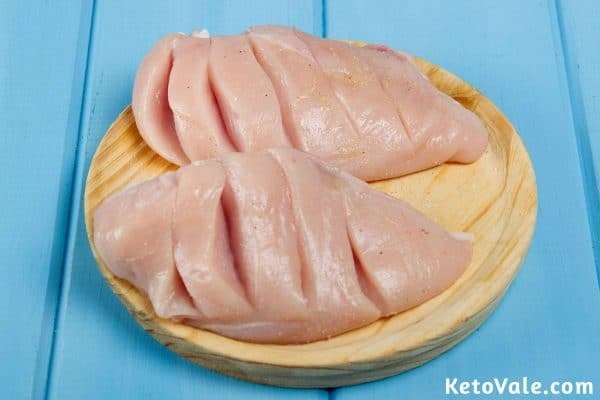 Wash the chicken breast thoroughly then dry with some paper towels. Slice 4 deep slits in the breast on a cutting board. Be extra careful not to slice the chicken in half. Brush the entire chicken with olive oil. Rub both sides with Italian seasoning and minced garlic. Salt and pepper for more flavor. Sliver the bell pepper, zucchini, onion, and tomatoes to make thin slices. 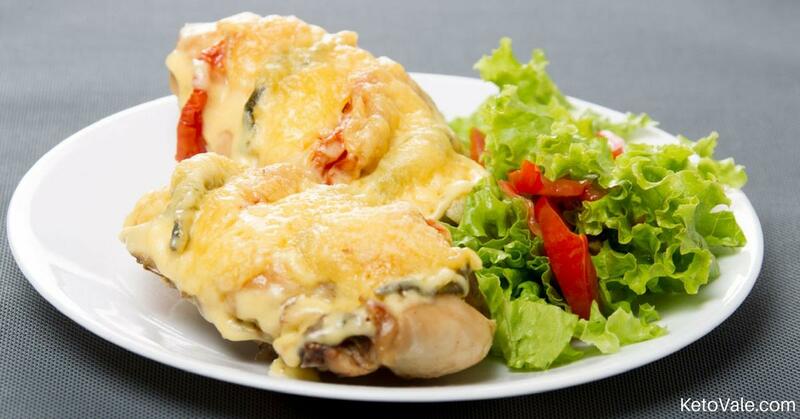 Insert the vegetable slices into the slits in the chicken. Arrange neatly. Sprinkle generous amounts of cheese on top. Lay the chicken breast on a baking sheet sprayed with cooking oil. Put inside the preheated oven (set to 375°F) for half an hour. Check if the meat is cooked before removing from the oven. Serve in a dish with lettuce salad on the side.